Let’s get something straight: The Ducati Panigale V4 is a stunner of a motorcycle. If one passes by you on the streets, it’s sure to turn your head around. But that’s the thing. 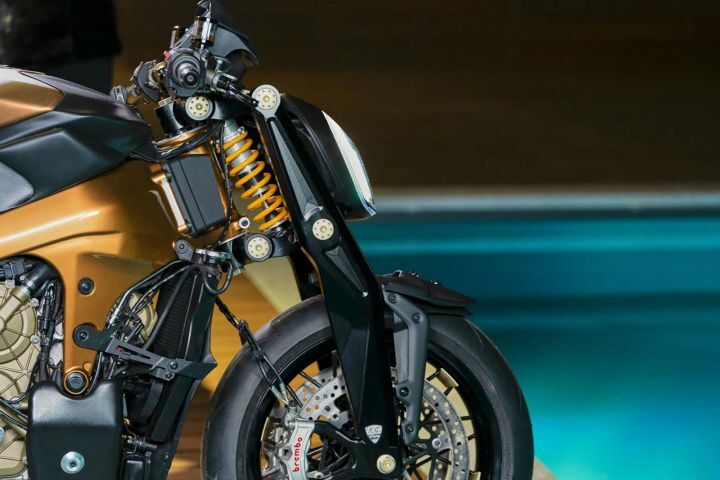 The V4 is an out and out track bike, so the chance of seeing it crawling in traffic is pretty slim… or is it? 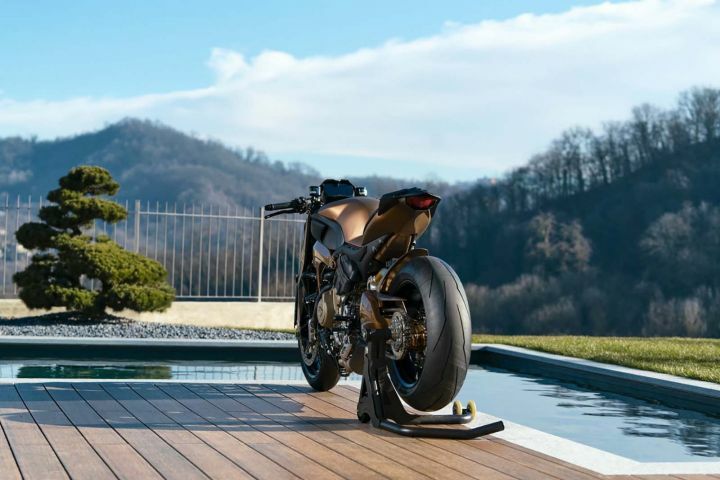 While our wait for a V4-powered naked bike from Ducati continues, the folks at Officine GP have come up with something that ought to do the job for now. Called the ‘V4 Penta,’ it is essentially a stripped-down version of the Panigale V4. But doesn’t it look like another famous naked Ducati bike? Well, that’s for a good reason. 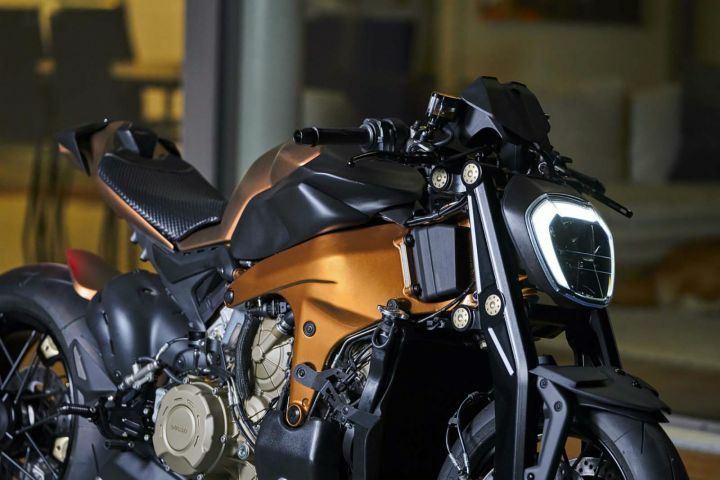 The motorcycle trades in its full fairing and front headlamp assembly for the one found on the Ducati Diavel. While all the fancy electronic bits are expected to be carried over to keep things safe and modern, there are a few old-school touches too. The aluminium girder forks replacing the USD setup looks especially eye-catching to us. Also gone is the traditional Ducati red paintjob for a specially made copper texture, which…errr.. helps it look shiny? To be honest, we’d preferred the red instead. The standard instrument console is carried forward here but is now placed on a special 3D printed mount. In typical custom build fashion, the saddle is made entirely out of leather with ‘V4 Penta’ embroidery on it. Small parts like the fuel cap, levers and footrests are replaced by more premium ones from Rizoma. All this sounds expensive, right? It probably is. While Officine GP hasn’t revealed the pricing yet, only 10 of these models will be made available. This isn’t a one-off creation from the chop shop. Their portfolio is filled with souped-up naked bikes from brands like MV Agusta, Honda, Suzuki and more. On the engine front, we suspect it packs the same 1103cc, four-cylinder V4 motor, churning out 217PS of power and 120Nm of torque. Although, expect the official production streetfighter from Ducati to be tamed down for better street riding. Speaking of which, the last streetfighter to come out of Ducati’s garage was based on the Panigale 1098, which came out almost half a decade ago. Since then the flagbearer’s of Ducati’s naked lineup has been the Monster series. So, would it be really surprising if we see the resurrection of the ‘Streetfighter’ brand this year? Especially considering the amount of success Aprilia has had with the Tuono V4 1100 Factory.